Leverage the power of social media to monetize your efforts, save you time and produce real results! Are you ready to build lasting and effective relationships online, expand your digital reach and attract targeted prospects to your business—all via social media? 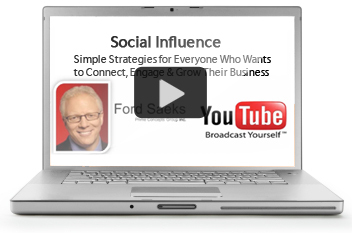 If so, purchase the Social Influence Webinar with Ford Saeks. New Social Media insights to build relationships and expand your digital footprint. How to leverage your efforts, save time and produce real results. Simple insider secrets to gettop search engine rankings. How to monetize your efforts with sites like YouTube, LinkedIn, Facebook and Twitter. The three critical factors that can make or break your online marketing. How to get tons of free traffic, improved usability and more sales. Strategies to create a value-added presence within your community of followers. It’s a fact. You don’t really own your brand anymore, your customers do. Ford will sharestrategies on how to navigate, protect, influence and leverage social media relationships. He’ll present strategies on how to leverage your brand, products and services through major social media hot spots, like LinkedIn, YouTube, Twitter,Facebook, and your blog. Ford sets himself apart from other social media “experts” with his unique combination of business and marketing knowledge. He has mastered the art of how to leverage the power of social media to monetize your efforts, save time and produce real results with social media.